Measure the ROI from a social media campaign, is much different than measuring a Pay-Per-Click or Banner Placement campaign. The reason is because there are many qualitative factors and other moving pieces that are hard to measure. Things like branding, company overhead, sentiment, customer interaction and exposure are all extremely difficult to measure using the traditional methods of tracking ROI. 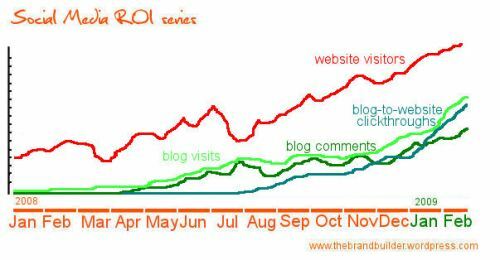 First you will need to have baseline metrics to have something to compare to while you begin your social media campaign. Your baseline metrics will differ depending on what social media platforms you are engaging in. Keep a detailed record for each tactic you are implementing. Using a calendar or timeline like in the graphic below illustrates, will help you put reasoning behind fluctuations in traffic/goal data. 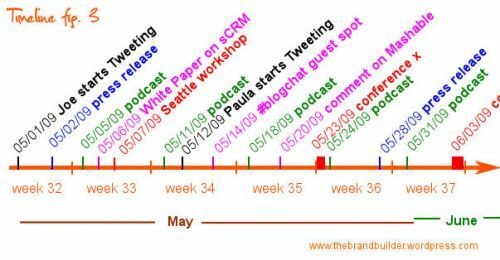 As you can see this company has been doing a number of social media tactics, including engaging on Twitter, launching a press release, created a podcast, workshop and etc… It is a good habit for your company to start a timeline similar to this one, so you can track all of your activities and the overall impact it has on your sales revenue. Comparing your baseline metrics to 6-12 months later, you can see a gradual increase in engagement and traffic across the board. ** Helpful Tip: Pay close attention to your referral source traffic and organize the data in terms of conversions by referral source. This can help to identify websites that are driving more qualified traffic. 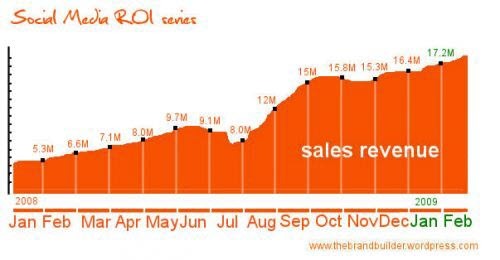 Like a mentioned earlier, you will not be able to measure your ROI using traditional metrics. Because a lot of social media is not going to have a DIRECT financial impact on your business, you will have to start with your initial investment and compare your sales revenue numbers with revenue 3, 6, 12 months down the road. 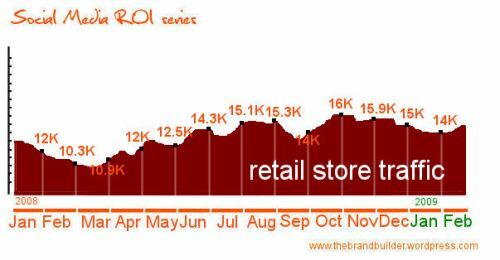 If you have a retail store, you may want to keep track of the amount of foot traffic coming through the door. If you notice that you have increased foot traffic by 25% since you started your social media campaign, you can tie that traffic into your efforts. Of course there may be other factors that could play a role in the increase (economy, seasonality, demand for product/service). Looking at the above graphics you can see that you need to take many factors into consideration. 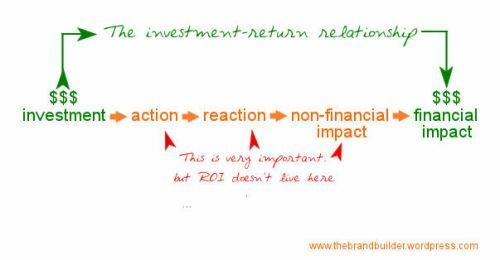 You are not going to judge your efforts like traditional ROI because of the intangible ROI and qualitative impacts. After 6-12 months of running your social media campaign you should ask yourself a few questions. 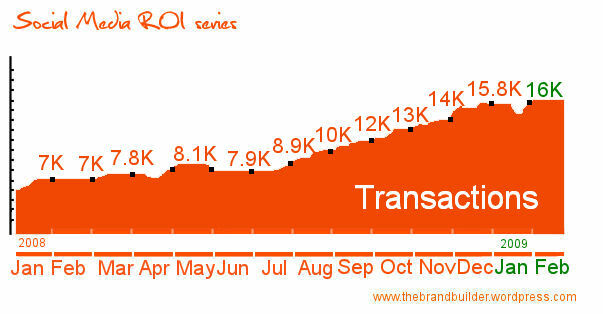 Did we see an increase in positive mentionings of our brand? Were we able to reduce customer service overhead because of our social media efforts? 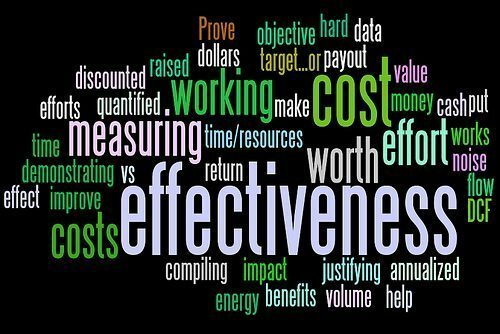 Were you able to reduce your PR costs because of your social outreach? Did our website engagements and goals increase? Did our overall sales revenue increase? There are probably hundreds of tools out there that will help you track your social media efforts. Of course, after reading this post you can see that tools are not going to necessarily tell if your social media ROI is negative or positive, but it can help track your qualitative impact. Google Analytics: It’s free and it can provide a really powerful baseline for a variety of different factors. You can track incoming links and then the activities of the users they send, which can be helpful. Radian6: A social media monitoring tool that will help you to track mentionings of your brand/company, along with provide a sentiment analysis to idneitfy positive/negative discussions around your brand. Social Media Metrics Plugin: Social Media Metrics is a greasemonkey extension that adds a social media information layer to Google Analytics, providing information on Diggs, stumbles, delicious bookmarks, and more for each individual page. Be aware – it’s not perfect.